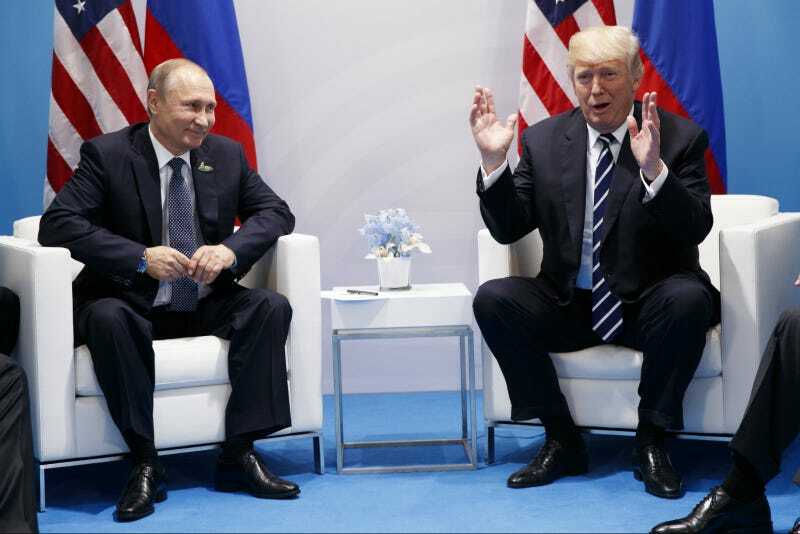 In news I think you probably saw coming, Vladimir Putin and Donald Trump had a warm and lengthy meeting at the G-20 summit on Friday. Afterwards, Russian officials claimed that Trump “accepts” Putin’s claim that Russia didn’t meddle in the United States’ electoral process. Oh. Trump and Putin met for an extraordinarily long time, some two hours and 15 minutes. The meeting lasted so long, according to Secretary of State Rex Tillerson, that Melania Trump went in there to try to speed things up but was unsuccessful. The meeting was attended by a small coterie of officials from each side, the New York Times reports, as a way to “avoid leaks and competing accounts later,” per their sources. As recently as Thursday, Mr. Trump conceded that Russia might have had some role in trying to sway the election on his behalf, but he also left open the possibility that other countries had taken similar actions. Mr. Putin denied “such involvement,” Mr. Tillerson added. He said United States officials would continue to discuss a “framework” for an agreement for Mr. Putin to vow to avoid such actions in the future. Mr. Tillerson was less than sanguine about the prospects of ever getting Russian to admit their meddling. “It may be simply an intractable disagreement at this point,” he said. “It may simply be an intractable disagreement” are certainly the strong and decisive words of a top American official holding Russia’s feet to the fire, aren’t they? Trump and Putin also reportedly agreed to a joint working group on cybersecurity, which would be a darkly funny joke back in the time when things were actually funny. U.S. officials are also saying they reached an agreement during the meeting for a ceasefire in Syria. Russia has been sending ammunition and weapons to the Syrian government for years, refusing to withdraw their support even as the Assad regime used chemical weapons in an attack that killed more than 80 people, including many children. The Trump administration will very likely focus on the Syria part while downplaying the very embarrassing elections-meddling part of the discussion, and if you doubt that, there’s probably a raft of all-caps tweets waiting for you tomorrow morning.